Winner of IFFR’s Bright Future section, which is dedicated to emerging filmmakers, Aya Koretzky’s A volta ao mundo quando tinhas 30 anos (Around the World When You Were My Age) is a road movie of sorts, except that—like the snail that appears periodically throughout the film—its mode of travel is slow and rooted in nature. Narrated through excerpts from her father Jiro’s travel diaries and 35mm slides, interspersed with contemporary footage Koretzky shot in and around Jiro’s home in rural Portugal, the film is an act of recollection for father and biography for daughter. It is also a manifesto for ecological living, with Jiro’s farm and garden in Portugal providing an oblique critique of the nuclear energy, urbanisation and consumption he left behind in Japan and elsewhere. Loving, captivating portrait of the director’s father based on the latter’s 1970 round-the-world journey. Using photographs from an old, forgotten metal box, Aya Koretzky reconstructs the trip around the world her father undertook in 1970. 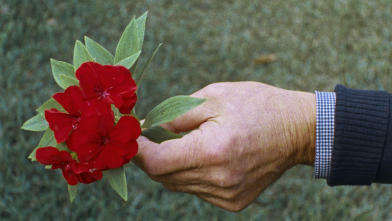 This creates a loving, charming portrait that provides a new perspective on the taciturn elderly man we see gardening. Born in Japan in 1983 and moving to Portugal aged 9, Koretzky is currently based between Lisbon and Paris. She has worked on several fiction and documentary films as co-director, cinematographer and editor. In 2012, her debut Yama no Anata (Beyond the Mountains, 2011) received its international premiere at IFFR. Exploring Koretzky’s transition—geographic, cultural, emotional and linguistic—from Japan to Portugal through written correspondence and family photographs, Yama no Anata anticipates A Volta’s investment in spatial and temporal displacement. IFFR spoke with Koretzky shortly before the international premiere of A volta ao mundo quando tinhas 30 anos. Although A volta ao mundo quando tinhas 30 anos is about your father’s memories, let’s begin by talking about your own move from Japan to Portugal. My first film, Anata no Yama, recollects that transition through letters that I wrote to friends and family in Japan. It was in 1992, before email and skype. Our house in Portugal didn’t initially have electricity or a phoneline, so I felt very distant from Japan and lost many friends. But our new life in Portugal was a big adventure too—we renovated a 17th century house that had no roof. Your father is Japanese and your mother Belgian. Why did they settle in Portugal? They wanted to live sustainably and searched for areas where they could keep an organic farm and garden. Ironically considering the disaster in 2011, they considered rural Fukushima, but eventually chose Portugal where there were no nuclear power stations. How did you begin work on A volta? I found a metallic box at my parents’ house that was filled with slides and diaries from my father’s travels. We see this box in the film, buried in the ground. This is a metaphor for someone’s becoming embedded in a place and its land. Looking through the contents of the box, I became fascinated by the stories the images and words told. To make the film, I shot each 35mm slide in 16mm with my Bolex camera. It was a lengthy process because there were more than 2000 slides. The film’s boxy 4:5 format preserves as much of the proportions of the 35mm slides as possible. The metallic box reminds me of another container we see in the film: the orange suitcase that you film floating down the river and later, as your parents open it and a child climbs out, as if hatching from an egg! After writing and before shooting the film, I had a child. The scene in which my little son climbs out of the suitcase is a reflection on the idea of a trip. When my father was 30, he made his trip around the world. And now, in my 30s, I was making a trip too, by having a child. The film was a pretext to know my father better, but also to know myself. I didn’t want to be illustrative in my use of old images and diary excerpts. This is why I filmed aspects of my own life, including my son. There’s one moment when I show myself in the film, in mise-en-abyme. My father takes a polaroid of me and I appear in the photo as its chemicals develop. You see me holding the camera. That scene also seemed like the signature of filmmaking itself, with the photographic image developing as your father shook it in the light and air. Another image that stayed with me was a snail who we see on a globe in your father’s room. The snail has a house on its back and moves around with it. That’s my father, with his heavy backpack and slow journey across the globe. Tell me about the film’s sound design. Sound is very important as a means to activate the still images and weave them together. I worked with musicians to record original music, and a sound designer and editor to make layered soundtracks for each image. I wanted to enunciate images, constructing a soundscape for each. Working with layers of sound, music, still and moving images, and spoken and written text, your process seems multilingual. You’re trilingual yourself, and I’m wondering if you also see a connection here. Yes, I suppose so. We express ourselves differently in different languages. In my films, different elements exist alongside each other. It’s as if I’m putting all the languages I know together, but also respecting their distinctness. Before filmmaking, I studied painting and photography, also piano—all these elements are like languages too. In the film you discuss losing Japanese fluency as you grow up in Portugal. The film is about ephemerality. The fact that everything changes and disappears is at once frightening and very beautiful. I wanted to make a film about the past and future, and this is why it contains my father’s ageing and my loss of language. You lose some things, but you gain others—including your beautiful son. Yes! Natural cycles are like that—loss, new life, and recurrence.